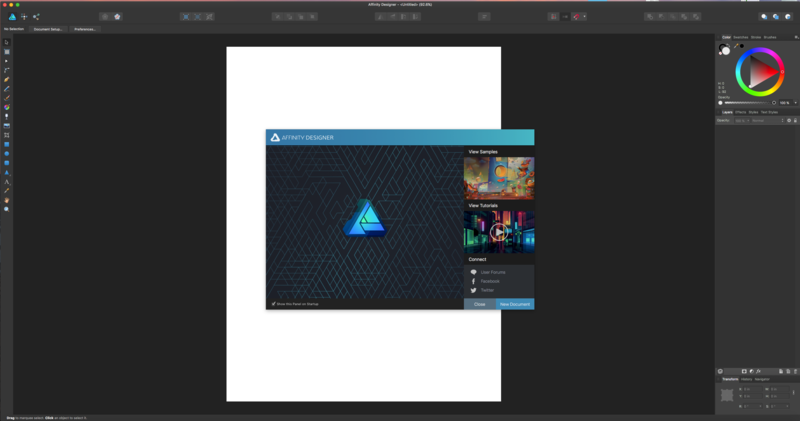 According to your web site, when I purchase a copy of Affinity Designer 1.5 I should get a copy of Grade UI kit for free. 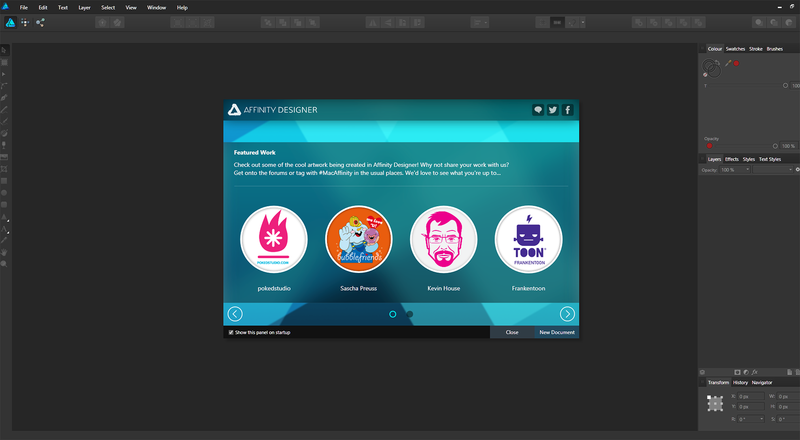 I just purchased and downloaded Designer 1.5 today from the Apple Mac Store. When I start the software, it doesn't give me the option to download the UI kit. I click HELP/WELCOME and there is no option to download the UI kit. What is the deal? What do see on the Welcome screen instead, can you provide a screenshot? In the Welcome Screen, Grade UI Kit page (see screenshot below), click the download button in the middle of the screen. You will be redirected to a webpage which you should fill to get the link to the Grade UI Kit. I have attached a screen shot to my original post. Yea, that would be nice if that download button would show up. How do I show a screen shot? I can't find a way to upload it. I included a screen shot as an attachment when I originally wrote the post but it doesn't show up for some reason. Click on the More Reply Options button, you then get an option to Attach Files. Well, the second time I started the program the link showed up. So good to go now. Thanks. Glad it's all sorted, the same can happen it you aren't connected to the internet or if the app was being blocked from connecting to the internet. Isn't the update available from the Updates tab on the top of the Mac App Store app? If not you can try to log-out and log-in again from the App Store app or uninstall the program and install it again. This can/will happen it you aren't connected to the internet or if the app was being blocked from connecting to the internet. The page you are not seeing is from a live stream, with a live link. The network I was on was apparently blocking it. Once I logged into another network it worked as expected. Thanks for the quick response. The link for me never came through and when i try to input my details again for it to resend the link it says I've already registered. Can someone provide me with the link? Sometimes it may end there. It seems it just took quite a while to come through. Affinity is on my whitelist so I was pretty sure it wasn't being blocked or going in spam. It took a good 10 minutes to come through though. >>In the Welcome Screen, Grade UI Kit page (see screenshot below), click the download button in the middle of the screen. 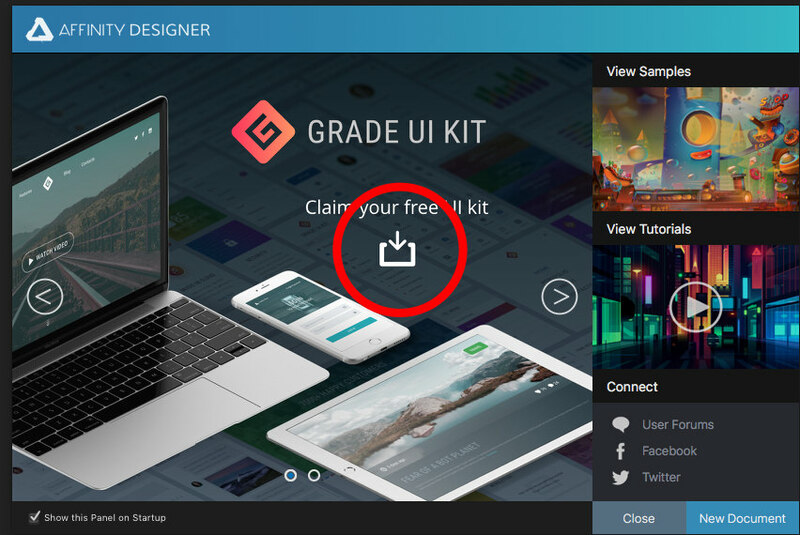 You will be redirected to a webpage which you should fill to get the link to the Grade UI Kit. From the link on the Welcome screen I am taken to a screen prompting for name and email. When I hit submit, a message appears saying that this email address is already registered. Nothing more. No download button, nothing. Please check my reply to your other thread here. Let me know if you haven't received the link. Hi everyone. It's my first post and i'm glad to be here, however i also feel sorry that my first post has to be a moaner. So i went through all posts in this thread and none of the solutions seems to work for me guys. I've bought AD for Windows via your website, installed properly and i have given all possible green lights for AD in my firewall/network settings. Any ideas? I've got one. WOuldn't it be easier for you guys at Serif to generate promotional codes for all early buy bonuses, based on purchase serial numbers?